I was alerted to I Am Patterns, a new (to me) French pattern company by Jen. I love both the Pan top and this, the Aphrodite dress. At the time though, I had no need for a backless dress. Then I was invited to a wedding reception of a colleague and although I have plenty of dresses that would suffice, an idea was born. This is the first time I've bought a paper pattern in I don't know how long! I normally go for PDF for cost, immediacy and I figure tracing is as joy-killing as sticking together a PDF. It was nice though to have a "proper" pattern for a change, and this one comes in a nice sizeable envelope, big enough to also hold the additional traced pattern pieces. The pattern was the easy bit though. This dress went through a lot of iterations before I actually placed a fabric order. The only finished versions I could find online were on French blogs, and with the help of a french dictionary and my 2nd year at Uni French (where we learnt no sewing terms. Honestly! 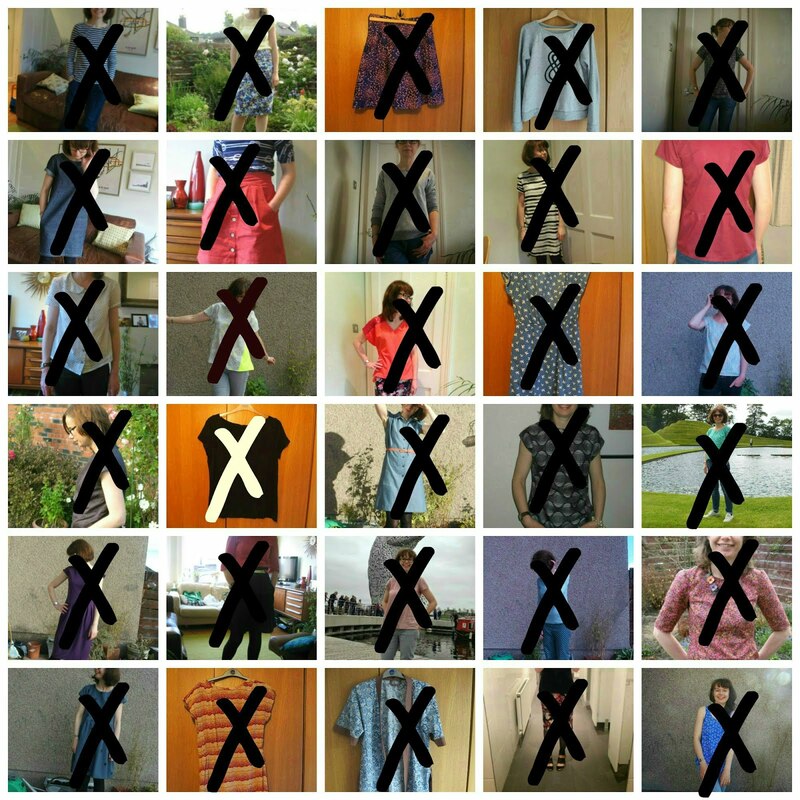 ), I managed to figure out that most of them had used fairly robust fabrics. I also ummed and ahhed for a long time about whether to make it backless or not, even conducting an IG poll (results: 50/50 for and against). In the end, I decided I wanted a solid colour, but not black, and that I probably wanted a lace or similar insert. I particularly fancied a geometrical lace, or even something laser cut. I love the look of the stripe lace in this skirt, although obviously it's black. I made a quick, but fairly comprehensive muslin in the size 38 and I made the muslin backless to check how it felt and looked on. As suspected, the backless was just too... bare. As the dress is a boxy shape the back stands away from you a bit, so I just felt that anyone tall would have a great view right down to my knickers. Not what I'd feel comfortable in. So, back to the lace. The lace was from Stone Fabrics. I couldn't find anything that fit the idea in my head, but this was suitably unflowery, with more of a foliage design and quite lightweight. It's also a beautifully rich royal blue and was only £8.50/m! It also appears to be the same lace that Rumana used for her dressing gown in last week's Sewing Bee. Even P recognised it! The rest of the fabric is poly crepe bought from Fabriclab on ebay. It's the exact same fabric that Jen used for her Inari, but in a different colour. I actually bought the colour she has too, as I was short of time to order swatches and I didn't know which would work best with the lace. It has a lot of drape and is surprisingly lovely for the price (£6.99/m), but it's quite staticky and it frayed badly. It also doesn't press well, and I have a few shiny bits as a result. The dress isn't hugely well made, but I had about a week to make it so there was no time to redo things that didn't absolutely need it. As a result, there are a few puckers (you can see them in some of these photos), a few wispy thread poking out from my French seams and one of my bust darts has a bubble at the end. When I made the muslin the dress seemed fairly roomy, and I considered sizing down. But with a seam allowance of 3/8" I would have had to trace a smaller size, then add seam allowance to do French seams, so instead I stuck to the size I muslined and instead took a SA of 1/2". In hindsight I should have stuck with the original size, as it's now a little tight over the thighs and when getting it off and on (there are no closures of any type), but it's totally wearable and comfortable. The only other changes I made was to add 5cm to the length. I'm glad I did as it ended up pretty short as is, and at 5'6, I'm not overly tall. And I cut about 6cm off the length of the sleeve as it felt more summery. The pattern itself was fine. 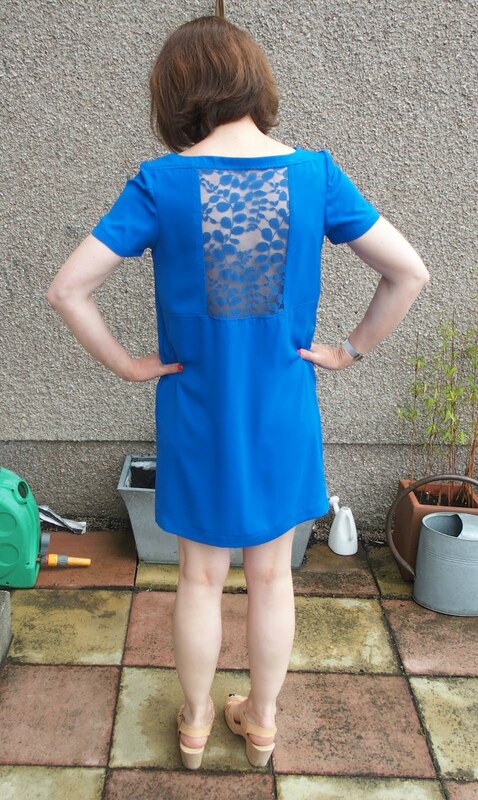 Apart from the back detail it's a fairly simple dress to put together. The instructions come in French and English and the English translation is not quite right. For instance on the facing it instructs you to topstitch, when it clearly means understitch. I suspect this is a translation issue rather than poor instructions though, and as the dress is marked as Intermediate, I don't expect this would cause anyone any issues. On the English translation, all measurements are in inches, whereas they are in cm in the French version. I used a hybrid of both, because I can't cope with 16ths of an inch. The backless version has the edges topstitched, and the full back does not, but because the poly was hard to press and I didn't want seam allowances showing through the lace, I topstitched here. I think it looks quite nice. Topstitching lace is good because you can see through the lace to your SA markings on your machine! :) One thing that I found odd was that there wasn't a double notch on the back of the sleeve and bodice, so I was kind of left guessing as to which was the front and which was the back the sleeve. Another quick IG poll backed up my thoughts, and it seemed to work, but why cause the confusion? Ignore the smartarse comment from my brother! I really like the resultant dress, and I really enjoyed wearing it. The colour is glorious, and I love the lace insert (pity I can't see it when wearing it though...). It feels a little short for bare legs, but I'm going with it. Just need to work the fake tan! The only downside was the underwear. I wore the stick on bra that I wore with my Ailakki jumpsuit, but it didn't really work. It kept unsticking! It was a really hot evening, and there was a fair bit of dancing, but I had to keep fiddling with it all night. I'd like to wear the dress again, but am not overly keen to keep wearing that bra, so I might have to come up with some other alternative. Maybe I could just style it out with a matching bra? I doubt I'll ever wear a backless version, however gorgeous it looks, but there is lots of scope for playing around with contrast colours or textures in that back panel. I think with a bit of length added, it would be so cool as more of a daytime dress. Imagine pleating/pin tucks in the back, or a bit of stripe directionality (my current crush), or a simple colour block? And although the pattern doesn't suggest it, it would definitely work in a stable knit. Lots of possibilities, fully justifying the £14 price tag for the pattern! I will be making this again. Try them, try them and you may.Try them and you may, I say. Small Boy's school had Book Week at the beginning of May. This seems to be peculiar to their school, and is not a national thing, but it's a nice idea. Mostly it involved sharing their favourite books, reading with their P7 buddies and tanoy instructions to "stop, drop and read"!!! It also afforded the chance to dress up as a character from a favourite book on the Friday. His first suggestion was a Stormtrooper and I had to gently inform him that although, yes, you do get books about Star Wars, it didn't start out as a book. We were reading Roald Dahl's The Witches at the time, but there wasn't anything that I could easily make that he could dress up as from that. I was drawing the line at a mouse costume. 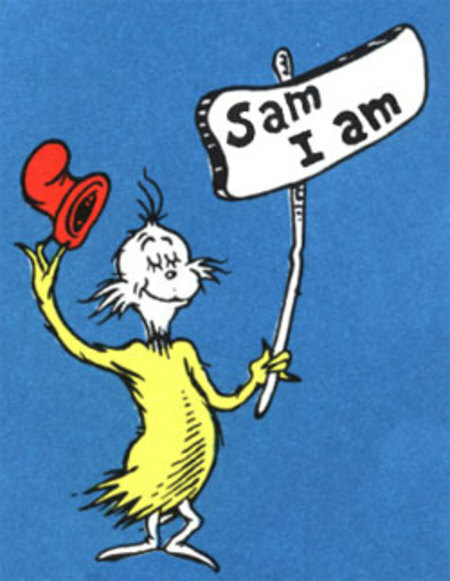 Instead, I suggested Green Eggs and Ham, and Sam-I-Am. I thought it would be easy. It probably could have been if I wasn't me. We eventually settled on a yellow t-shirt, with some stencilling (to make it clear who he was meant to be) with cream coloured trousers that he already owned. He was insistent on the hat. Due to tight timelines, I sourced my fabric from Primark. I thought I'd be able to buy a plain yellow tee, but no such luck, so instead I bought 3 tees for £1 each, so that I could cut them up to make a tee. I generally don't like shopping in Primark for many reasons, so it sat a bit uncomfortably with me. The fabric is appalling quality and I really wish I'd had more time to source decent quality fabric, as I'm really proud of the finished article and just hope it lasts. Using the backs of the 3 tees (the fronts had a print) I was able to cut one front, one back and 2 long sleeves. The sleeves are a bit off grain, but then the fabric was to begin with!!! I did the stencil using freezer paper again. I googled images from the book and printed them to size and traced and cut them. It was really fiddly and took ages. It honestly took about a half a day to cut and stencil the tees, but I really enjoyed it (bar the constant fear I was going to mess it up with the final cut!). I stencilled the black outline and had planned to stencil the other colours, but ultimately decided just to colour them in with fabric paint, which I think worked fine (and took considerably less time). To save time, energy and my sanity, I only painted the green eggs and ham. I am beyond happy with how it turned out. The t-shirt is yet another iteration of the Rowan Tee, and again I used the existing hems, which saved time. I was also able to reuse the neck binding from one of the original tees, so it does look pretty good despite the fabric. The hat is made from red felt, using a rough tutorial I found on Pinterest, which I now can't find. It turrned out way better than I expected and it had to be forcibly removed from Small Boy's head at bedtime. There's not much more to say about this, so here are some pictures of Small Boy showing off! 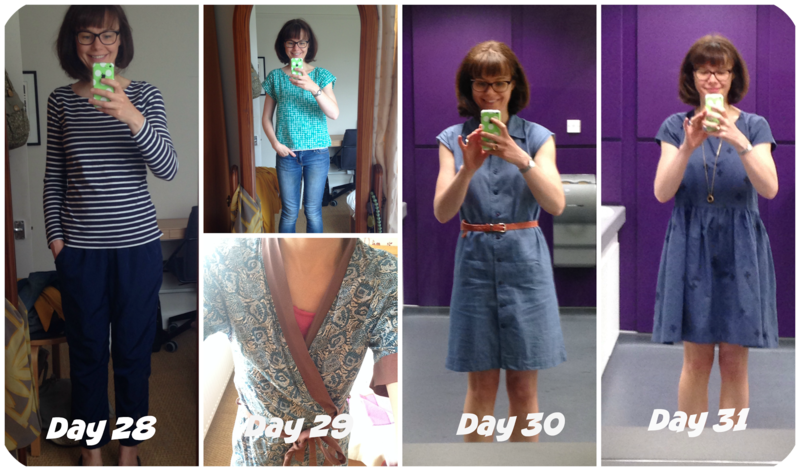 Me Made May - Final days and round up! May = quickest month ever! Can you believe that's Me Made May over already? And we are nearly halfway through the year? So, let's start with a quick round up of the final days of MMM. This is the second time I've worn these and although I'm still feeling ambivalent towards them, I did enjoy wearing them. They are comfy to wear, although I do feel like I have slightly restricted movement in them. My calves are fairly chunky (in relation to the rest of me) and as a result, if I crouch or bend, the fabric sticks over my calves and pulls the waist down a bit. There is no danger of flashing, as they high waisted to start off with, but I am always conscious they need fiddling with. How often do I crouch or bend down? Well, I have a toddler and I cut out fabric (and do a lot of pinning) on the floor. So, quite a bit as it turns out. I'm also still not convinced of how flattering they are but I'm going to keep them a bit longer. It was nice to have a casual trouser that wasn't jeans. Keeper. Additional photo - not instagrammed, but to show that I did wear my Liberty kimono during the month. This was another garment I started off feeling ambivalent about but ended up loving by the end of the day. Partly compliments, partly I just liked wearing it. It's the first time I've worn it with bare legs and clogs and I really like it like that, although between the short length,, the fact that it's a little tight and the gap at the bottom before the bottom button, it does border on indecent when I sit down... But chambray! Keeper. In terms of the challenges I set myself, I achieved them. I wore something handmade every day. Not only that, but I managed to wear, or at least try on and discard, everything bar the 1974 dress, which I couldn't wear as I didn't have enough time to repair it. That means I wore 32 of the 33 possible items initially recorded, plus 2 additional items I'd forgotten to include initially - 34 items, all handmade! Of them, 3 items were to be chucked out/used as muslins/refashioned where possible. I have a few items that won't get worn every day, but that's OK as long as I do wear the outside of MMM. I also have a few items which would benefit from being altered a little, so I need to make that a priority. 1. I am really bloody proud of my handmade wardrobe. 2. I actually wear most of the garments on a regular basis. I thought I didn't and I expected to get rid of more but really that was more of a seasonal thing, I think. I guess my spring/summer sewing game is stronger than my winter one. 3. 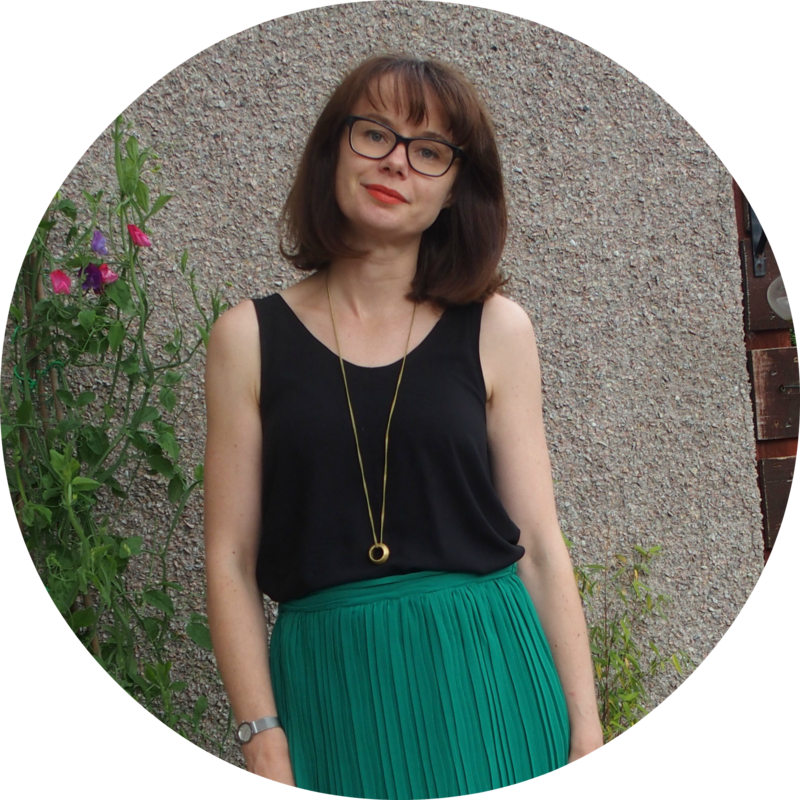 My work wardrobe needs more trousers, whether handmade or not, but seeing as I have fabric and patterns, I should probably challenge myself to make them. 4. I don't have a seasonally appropriate jacket for work. I very much doubt I'll get round to making one before it gets colder again, but something to think about. 5. This was the first Me Made May that I didn't panic sew. I guess I felt less need to, but the real reasons were that time was limited and I had to focus on other things (boys t-shirts, dress for a wedding reception). It also meant I didn't revisit anything that needed a fit adjustment or a repair. They are still on my to do list. 8. ...I should think about making more t-shirts. I seem to buy jersey but I don't really sew it, unless it's for the boys. I don't *need* t-shirts, but again, the fabric and patterns are there, so why not? 9. I haven't gone off vintage entirely! Which makes me want to revisit some of my vintage patterns. How did you get on with Me Made May this year. Any revelations? Gosh, May is over already and what a month! Me Made May was great fun, and I will write up my thoughts on that in a separate post. It's also been super busy both socially and at work, so there hasn't been a lot of time for sewing, and what sewing there was, was mostly for the boys! 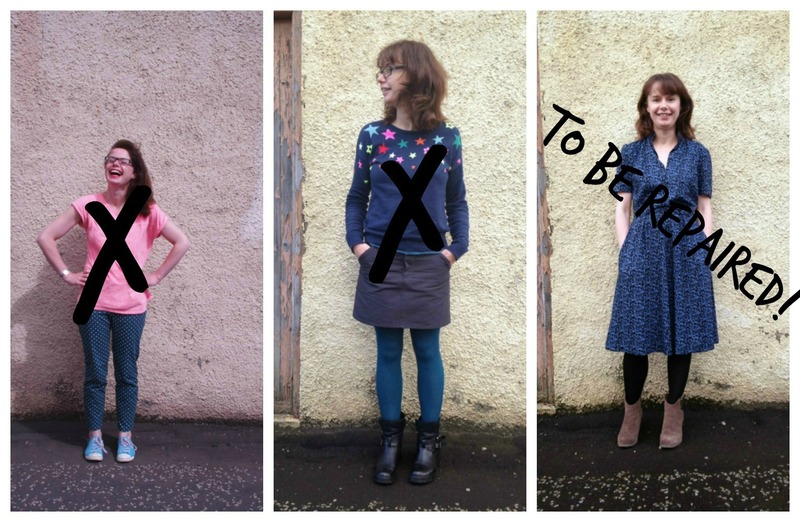 Anyway, I am off work next week so hoping to get caught up with both sewing and blogging. I have finished a dress that I plan to wear to a wedding reception tonight, but no photos yet because I am working today (writing this in my lunch break). I'll try to get a photo on IG tonight at some point. Despite not having much time to sew, I still seem to have managed to buy quite a lot of sewing related stuff! So much for managing to spend nothing last month. That's been blown out of the water this time around! Meant to say "May Total", obvs. The silk organza is to make a rub off from RTW jeans, using a Craftsy course, plus a little extra to make a pressing cloth, which I have needed for some time. 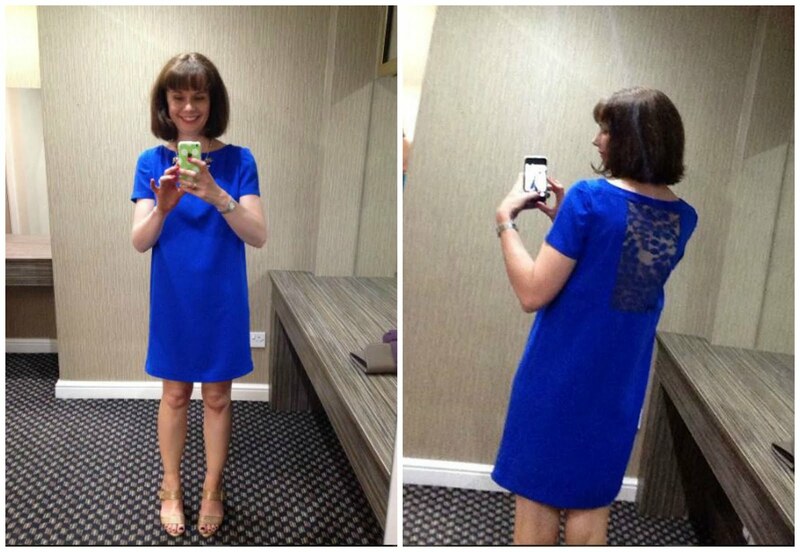 The Aphrodite pattern is the dress I have made for tonight's wedding, using the lace from Stone Fabrics and the poly crepe from ebay. Well, one of the crepes. I didn't have time to order swatches, so I ordered 2 x 2m lengths in a bid to get the correct colour to go with the lace. 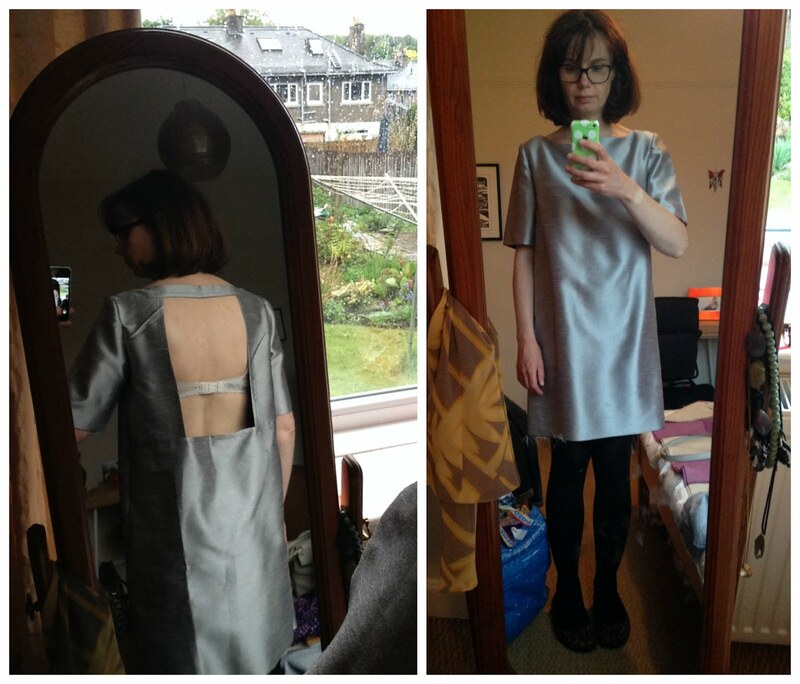 The other length of poly crepe will go to make another dress, tbc. I bought some of this Atelier Brunette viscose previously from elsewhere but they didn't have enough in stock. When I found the same at Backstitch, I didn't hesitate to order more. The plan for this is the Biscayne pattern, also bought this month, while on offer. The denim tencel was an impulse when I ordered lace swatches (FOC), and it was too lovely to pass up on. It will either become an Archer shirt or a shirt dress. Actually I can think of a million other things I could make with this fabric and I kind of wish I'd bought more. Lastly, Hobbycraft had 50% off Gutterman thread when I popped in for thread for my Aphrodite, and I took the opportunity to stock up on black and white thread too. It's not great, but at least some of has already been used. Next week I intend to have a good sort through of my fabrics and to start putting some plans together, as well as hopefully finishing a garment that's been a WIP for weeks. On the whole, this not buying fabric thing is not going well, and although I've had a few good months. I am still buying quicker than I can sew, which isn't great. I *will* do better in June.